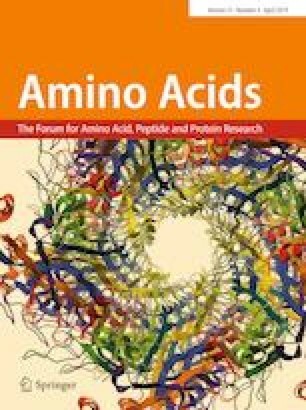 Knowing the key features of the structure and the biochemistry of proteins is crucial to improving enzymes of industrial interest like β-fructofuranosidase. Gene sacA from Bacillus licheniformis ATCC 14580 codifies a sucrose-6-phosphate hydrolase, a β-fructofuranosidase (E.C. 3.1.2.26, protein BlsacA), which has no crystallographic structure available. In this study, we report the results from numerous biochemical and biophysical techniques applied to the investigation of BlsacA in solution. BlsacA was successfully expressed in E. coli in soluble form and purified using affinity and size-exclusion chromatographies. Results showed that the optimum activity of BlsacA occurred at 30 °C around neutrality (pH 6.0–7.5) with a tendency to alkalinity. Circular dichroism spectrum confirmed that BlsacA contains elements of a β-sheet secondary structure at the optimum pH range and the maintenance of these elements is related to BlsacA enzymatic stability. Dynamic light scattering and small-angle X-ray scattering measurements showed that BlsacA forms stable and elongated homodimers which displays negligible flexibility in solution at optimum pH range. The BlsacA homodimeric nature is strictly related to its optimum activity and is responsible for the generation of biphasic curves during differential scanning fluorimetry analyses. The homodimer is formed through the contact of the N-terminal β-propeller domain of each BlsacA unit. The results presented here resemble the key importance of the homodimeric form of BlsacA for the enzyme stability and the optimum enzymatic activity. Alain Mera and Mariana Zuliani Theodoro de Lima contributed equally to this manuscript. The online version of this article ( https://doi.org/10.1007/s00726-018-02690-2) contains supplementary material, which is available to authorized users. We would like to thank the National Synchrotron Light Laboratory (LNLS, Brazil) and Central Experimental Multiusuário da Universidade Federal do ABC (CEM/UFABC); Fundação de Amparo à Pesquisa do Estado de São Paulo (FAPESP) for the financial support via Grants # 2017/16291-5 (JRCM); # 2017/17275-3 (WG) São Carlos Institute of Physics/University of Sao Paulo; Conselho Nacional de Desenvolvimento Científico e Tecnológico (CNPq) for the financial support via Grants # 309767/2015-6 (JRCM) and 486546/2013-6 (JRCM); and Coordenação de Aperfeiçoamento de Pessoal de Nível Superior (CAPES) for fellowship to AM, MZTL. All authors of this work declare that they have no potential conflict of interest and that there is no financial, consultant, institutional or other relationships that might lead to bias or conflicts of interest in this research. Financial grants, infrastructure and fellowships supporting this work are described in the acknowledgements section. Consent to submit this work has been received explicitly from all co-authors, as well as from the institute and the university where the work has been carried out. All authors contributed to the scientific work and, therefore, share collective responsibility and accountability for the results.